together with a sentiment from Party Words -set. Wreath is made using 2 different bunches and some droplets. stamped image that goes with the theme. I love the different shades of green in your wreath. Wonderful combination of punches to make it. I also love the addition of the bird! Thanks for playing along with us at HLS December Christmas Challenge! Such a beautiful wreath card. 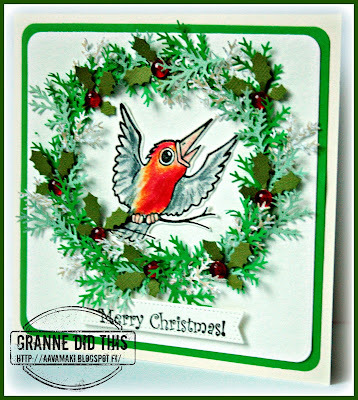 Thank you so much for joining us at Happy Little Stampers Christmas Challenge. Great card! Love the wreath! Thanks for joining us at Glitter N Sparkle!